Surely everyone knows Stephen Hawking. He’s the worlds most well-known physicist, known as much for his brain as for the body he inhabits; diagnosed with ALS (also known as motor neurone disease), he is mostly paralysed and only able to communicate through technology operated by a single cheek muscle. And the Theory of Everything is his story. His early days at university; the romance with his first wife, Jane; his diagnosis and gradual deterioration, and his ideas – developing theories and challenging his own theories. I’m sure it’s a good film. It’s an interesting story, the relationship between Hawking and his wife goes through all kinds of ups and downs, and all of that. Yet, I was a bit bored. Perhaps it is just because I pretty much know the story, although that can’t be it. I’ve seen loads of stories made into films and don’t get bored in all of them. There was also the scene where Hawking dreams of being able to get up and pick a pen for a pretty student. Listening to a great discussion about the use of disabled actors in films on the magnificent Ouch Radio Show through BBC, this type of scene is apparently very common in films with able-bodied actors playing disabled characters as it gives the audience a sense of relief that the actor is okay. This may be a somewhat cynical view of the reasoning for such a scene, but that scene brought nothing to the film and made me groan out loud. 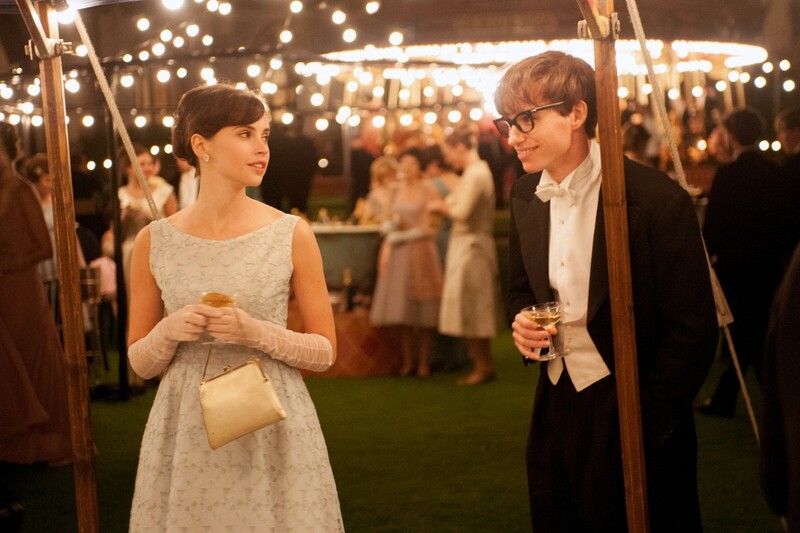 The Theory of Everything was nominated for Oscars for Best Motion Picture of the Year, Best Performance by an Actor in a Leading Role (Eddie Redmayne), Best Performance by an Actress in a Leading Role (Felicty Jones), Best Writing, Screenplay Based on Material Previously Produced or Published (Anthony McCarten) and Best Achievement in Music Written for Motion Pictures, Original Score. It won Golden Globes for Best Performance by an Actor in a Motion Picture – Drama (Eddie Redmayne) and Best Original Score – Motion Picture and was nominated for Best Motion Picture, Drama and Best Performance by an Actress in a Motion Picure – Drama. It was nominated for BAFTAs for Best British Film, Best Film, Best Actor (Eddie Redmayne), Best Actress (Felicity Jones), Best Screenplay (Adapted) Anthony McCarten, Original Music, Best Editing, Best Make Up/Hair, Best Costume Design and the David Lean Award for Direction.